Founded in 2008, Graze was the brainchild of 7 pals who all shared an unsatisfied enthusiasm for snacking. While they loved a little treat now and again, they were struggling to find any snacks that combined flavour, craft and nutrition. So after some careful cooking and plenty of taste tests Graze was born, and all seven founders quit their jobs to launch the company. With over 100 different snack combinations available, the company distributes thousands of snack boxes to homes and offices around the country and even expanded their operations to America in 2013. By 2015 they were enjoying acclaim on a national level, with The Sunday Times listing them as one of their ‘fast track 100,’ celebrating the year’s fastest growing companies. Graze uses a sophisticated algorithm called DARWIN to determine the best possible customised snack boxes for subscribers by factoring in their previous requests and ingredients. Graze is highly health conscious, avoiding all artificial ingredients and flavourings, eschewing all genetically modified products, and banishing high fructose corn syrup from every box. They also donate a portion of their profits to the Graze School of Farming charity, which educates Ugandan students living in poverty on effective farming techniques. How do I use my Graze promo code? Where do Graze deliver to? Graze boxes can be delivered to any postal address in the UK, from residences to office blocks. Can I order Graze products if I have allergies? Unfortunately not. As all Graze produce is packed in the same place, they cannot guarantee that snacks will be free of nut, gluten, wheat, eggs, peanuts, soy, dairy or fish. How do I choose the contents of my Graze snack box? 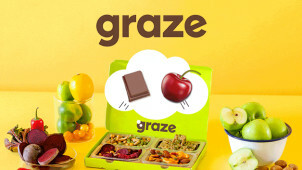 Graze keep your on your toes with surprise snack boxes based on the ratings you select online. After each box you can tell Graze what you like, helping them hone your future snack boxes. How do I cancel my Graze order? Go to your orders page and click ‘manage recurring order’ or ‘manage one-off order’ depending on the type of order you wish to cancel. Select ‘more options’ and then ‘cancel this order,’ to remove your order completely. Graze's customer service team can be reached by filling out their online form. Delivery of Subscription boxes are free, deliveries are dispatched on Mondays and Wednesdays between 9am and 5pm. Whether you’re looking for a sweet something to see you through a miserable Monday morning, or a healthy hit of protein to top up your energy levels, you’re sure to find the perfect snack at Graze, now for less with a Graze promo code. Delivered in slick and satisfying boxes, you can get a handle on your spending and your nutrition with a carefully crafted and easily affordable Graze snack pack. No two snacking occasions are the same, and Graze have curated a mouth-watering collection of munching moments for you, perfectly tailored to each snacking scenario. From their range of After Dinner Treats, for that cheeky bit of sweetness after supper, to Watching A Movie, for that sumptuous and all-too shovelable snack to go with your evening Hollywood moment. With Graze you can be sure that you’ll have healthy, hearty and delicious snacks to suit any occasion from dawn to dusk. If you get into a brouhaha over what to dip in your daily brew Graze have the perfect range of teatime snacks and treats, partnered with carefully picked infusions. You could enjoy some serious savings with your Graze discount codes, and get your hands on the finest infusions and their perfect snacky sidekicks for less. From a mouth-watering carrot cake to zingy lemon and poppy seed cake, complete with tailored teas, you’ll be counting the minutes until your next tea break.